Australia has a long history of National Parks, indeed, the Royal National Park on the outskirts of Sydney is the second oldest National Park in the world, having been declared in 1879, just after Yellowstone National Park in the USA. There are numerous parks spread all throughout the country, including of course, the Great Barrier Reef, encompassing the largest living entity in the world and the only one visible from space. There are parks that protect the wildlife in desert areas, tropical regions, mountains and stunning coastal areas. There are also numerous state parks, reserves and botanical gardens, all designed to protect the plants and fauna of this beautiful and diverse continent. All of them are worth visiting and most are easily accessible, though not all. Protecting not only important areas of aesthetic beauty but also cultural significance and on-going ecological and biological processes in the evolution of life are our 19 Australian World Heritage Sites. A large section of the Australian Capital Territory is both National Park and State reserves, from animal reserves to high mountain peaks. See more about the National Parks in the Australian Capital Territory. Map of the ACT showing Parks Australian Capital Territory Map. 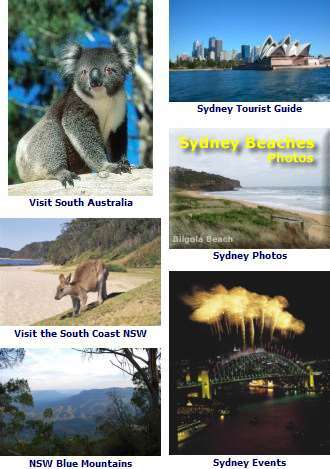 NSW National Parks Tourist Information - More about the many stunning National Parks in Sydney and New South Wales. Explore Aboriginal Culture, Australian wildlife and the NSW natural vistas. See the National Parks in NSW page for more. Snowy Mountains Map, NSW. The state of Queensland has stunning parks along the coast, but also in the North Tropical regions. Visit Queensland National Parks.